Posted by skyvu on Monday, August 6, 2018 in Accounts Payable, News, Procurement. 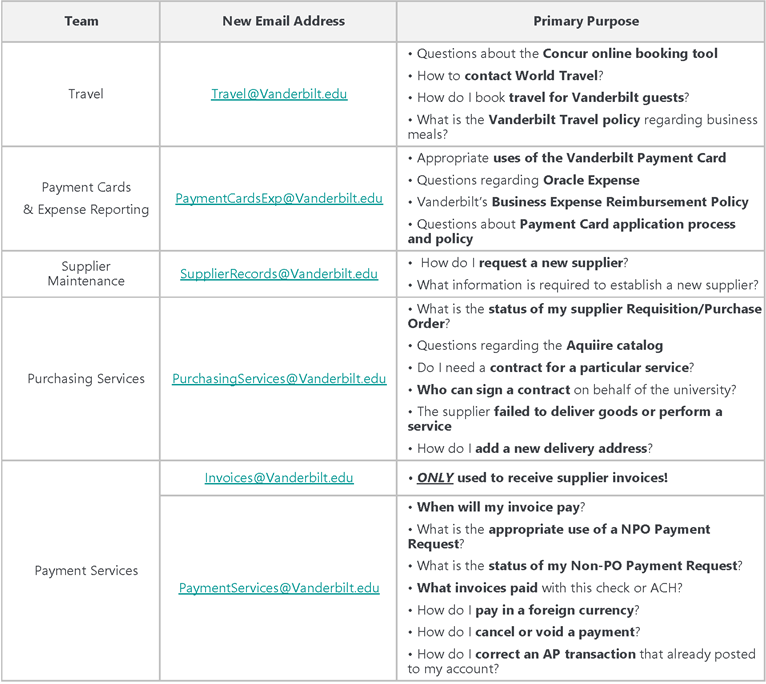 The Purchasing & Payment Services team has updated their support email addresses in order to simplify the options for users who need to contact them with questions. What will happen to the prior email addresses? The transition to these new group email addresses begins on Monday, August 6. Email messages sent to any group email boxes in Purchasing & Payment Services that are not listed above will be forwarded to the new email address, and you will receive an auto-reply notifying you of the new email that you should use going forward. Any of these Purchasing & Payment Services group email addresses not listed above will be deactivated on September 1, 2018. Click here to review additional details about this update.